This ASCD Study Guide is designed to enhance your understanding and application of What We Say and How We Say It Matter: Teacher Talk That Improves Student Learning and Behavior, an ASCD book written by Mike Anderson and published in February 2019. In this study guide, the author has shared a few ways to use this book to support deep thinking and implementation. He has offered a few suggestions in the hopes of supporting diverse interests and needs. Note that Options 1 and 2 are for individuals reading this book on their own, and Option 3 is for colleagues reading this book together. Option 1: You want to engage in a broad exploration of language. If this is your first time reading this text, especially if you're not familiar with the content, you might want to explore in a general and broad way. This will give you a chance to become familiar with many of the language suggestions offered in this text, which might help you decide on a way to try changing your language. If you're interested in a more focused individual reading, you might want to try Option 2. What are some of your positive goals for students? Consider reasons you might shift language patterns. Which ones feel important to you? Why are they important? Look back to the table of contents and examine the titles of Chapters 2–12. Which ones do you think might be especially important or relevant for you? Why? Consider the "few important points before we continue" (pp. 8–12). Jot down a few notes about the points that you especially want to keep in mind as you read this book. Step 2: Read Chapters 2–13. Each chapter explores a way that teachers' language is often out of sync with their best intentions and positive goals for students. (These can be overwhelming if read all at once. You might try reading one chapter at a time, jotting notes as you go. If, at some point, you come across one language habit that you know you want to work on, and you don't want to be overwhelmed by more ideas, skip to Step 3.) As you read these chapters, you might jot notes about some of these questions/ideas. What are some ways that your language already matches your positive goals and best intentions? What's language you want to keep using? What are some language habits that you might want to change? How might your students benefit if you change those habits? Consider creating your own t-charts (instead of—try this) as you read. What are some specific language shifts you might play with? Step 3: Are you ready to set a language goal? First, read the first section of Chapter 14 to better understand the importance of habits. Next, follow the rest of the chapter to set a good goal and plan strategies that will help you practice. Remember to be patient with yourself. Changing habits is hard work, and it takes a long time, but it's worth it! Option 2: You already have a language goal or challenge in mind. Perhaps you've read this book already and now you're ready with a more specific focus. Or you may have already read another book or engaged in other professional development related to language. Or perhaps there's a specific challenge you're experiencing with students, and you want to focus on that challenge. This version of the study guide will support you if you're looking for a focused individual exploration. If you're more interested in a broader reading, consider Option 1. What are some of your positive goals for students? Which ones especially connect with your challenge. Which of the reasons for working on language that are outlined in this chapter connect with your personal reason for working on your challenge? Step 2: Find the chapter (or chapters) that connect with your goal or challenge. It might be that there's one chapter that exactly fits what you're looking for. It could be that your challenge connects with several chapters. The following themes/topics and corresponding chapters might give you a starting place. What are some language habits or practices that you want to reduce or eliminate? What is some replacement language that you might use instead? Consider two important question: What might make this change hard? How will your students benefit from this change? Step 4: Finally, it's time to make a plan. Read the first section of Chapter 14 to better understand the importance of habits. Next, follow the rest of the chapter to set a good goal and plan strategies that will help you practice. Remember to be patient with yourself. Changing habits is hard work, and it takes a long time, but it's worth it! Option 3: Read this book together with a group of colleagues. What are some of your shared positive goals for students? Consider reasons you might shift language patterns. Which ones feel important? Why are they important? Talk about the "few important points before we continue" (pp. 8–12). Why might these be important to keep in mind as you continue to read this book? What were some specific ideas that felt important in these chapters? What were some questions that came to mind? What are some current strengths of your school as you consider these chapters? What are some potential improvements? What are some important connections between students' sense of safety and their academic engagement? What were a few key ideas that seemed especially important? What surprised you as you read? What questions arose? What management strategies in your school are in line with the ideas discussed in these chapters? Which management strategies are not in line with these ideas? Why might it be important for students to learn to manage themselves instead of relying on being managed by others (now in school and later in work)? What are some ways that we may accidentally decrease academic engagement through traditional teacher talk? What are some specific strategies that might support academic interest, joy, and motivation? How do your own personal narratives about school (your own experiences in school and as a learner) affect the way you feel about academic work (for better or worse)? What are some changes you might work on in your school as you consider how teachers talk about learning? What are some strengths of your school as you consider the way that adults communicate and work together? What are some challenges your adult community struggles with when it comes to relationships and communication? What are a few practical ideas for how adults might talk with each other more effectively? What are some personal language goals that you (individually) might try working on? What are some language goals that you (as a group) might work on together? What are some strategies you might use to support your language growth? How might your students benefit if you're successful with these changes? How might you work together (as a whole group or in smaller groups) to support each other? 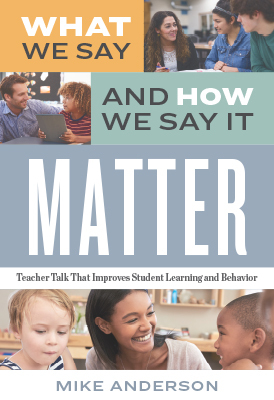 What We Say and How We Say It Matter: Teacher Talk That Improves Student Learning and Behavior was written by Mike Anderson. This 168-page, 6" × 9" book (Stock #119024; ISBN-13: 978-1-4166-2704-3) is available from ASCD. Copyright © 2019 by ASCD. To order a copy, call ASCD at 1-800-933-2723 (in Virginia 1-703-578-9600) and press 2 for the Service Center. Or buy the book from ASCD's Online Store. Copyright © 2019 by ASCD. All rights reserved. No part of this publication—including the drawings, graphs, illustrations, or chapters, except for brief quotations in critical reviews or articles—may be reproduced or transmitted in any form or by any means, electronic or mechanical, including photocopy, recording, or any information storage and retrieval system, without permission from ASCD.